While digging through my freezer the other day, I came across some pureed butternut squash that I made and froze last fall. It has almost been 6 months, so I needed to use it up! 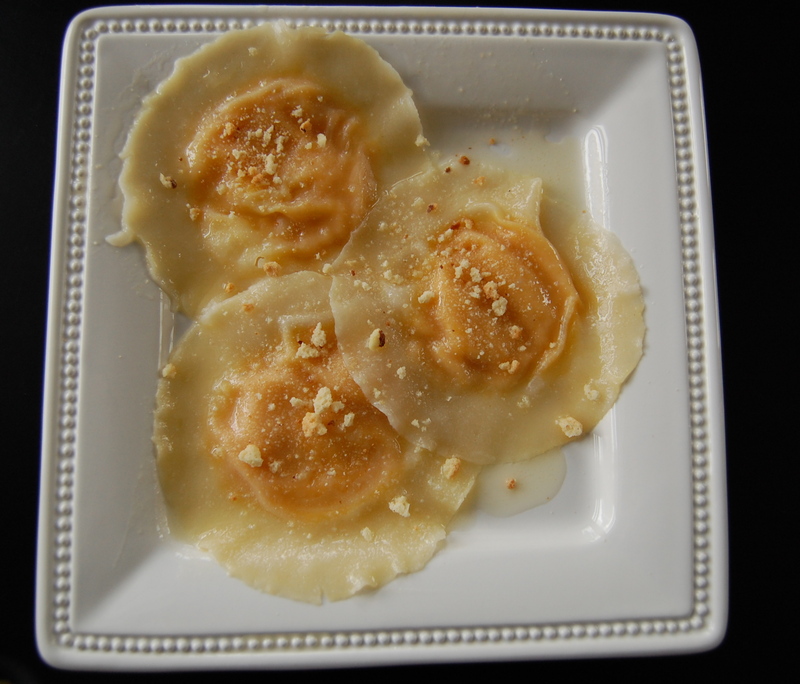 I got an idea to try and recreate one of my favorite Milwaukee dishes, Butternut Squash Ravioli from the amazing restaurant La Merenda. 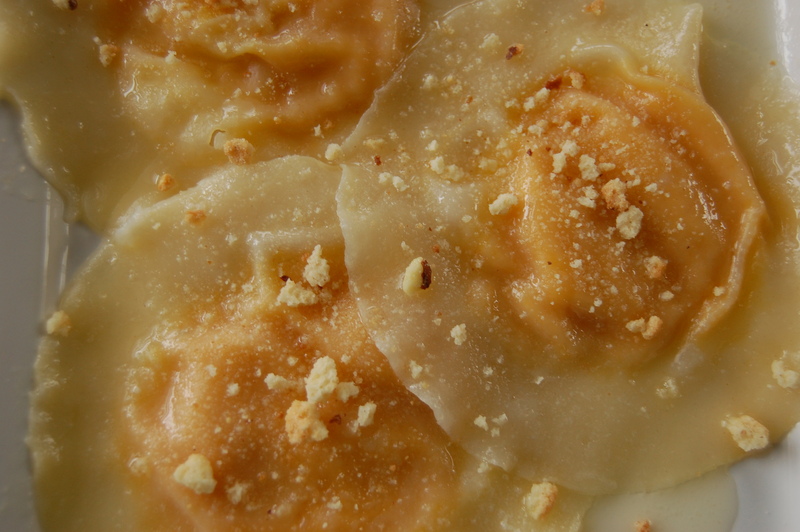 They are tender, sweet ravioli topped with melted butter and a crushed, crunchy almond cookie. I love the taste of simple, pureed butternut squash, so I wanted to keep the filling basic so the squash would be the standout flavor. 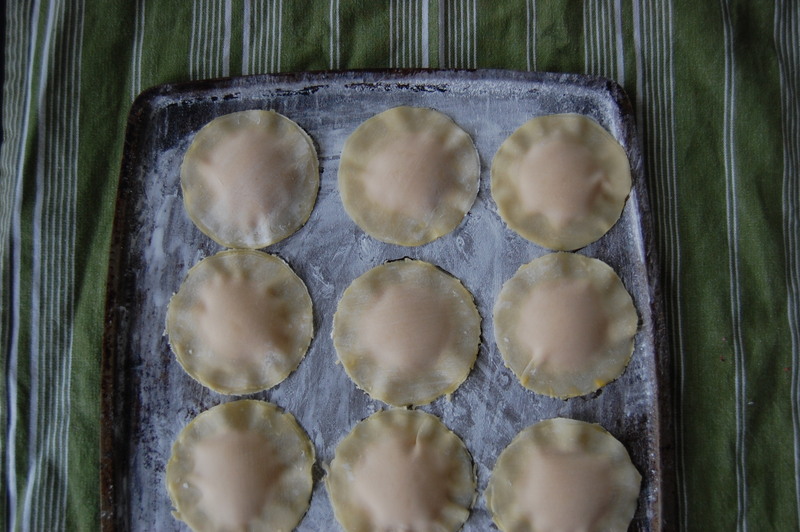 I decided to try out wonton wrappers instead of fresh pasta, which worked very well. Warning: This recipe is incredibly delicious but quite time consuming! It took me about 1 1/2 hours from start to finish. I will say that I think the outcome is worth the effort, but this is not a 30 minute meal! Start by making the filling. Blend the pureed squash with the ricotta and Parmesan cheese. Mix in a tiny bit of nutmeg and then place in the refrigerator to allow it to cool down. Place your chilled wonton sheets on a cutting board and cut into a circle either by using a biscuit cutter or top of a wine glass or mug as your guide, cut out about 36-48 evenly shaped circles. Set aside. In a seperate small bowl, whisk the egg. Also, grab a cookie sheet and generously sprinkle with corn starch. This will prevent the ravioli from sticking to the cookie sheet. Continue this process until you have used up all of the squash mixture. Bring a large pot of water to a boil. In a separate pan, melt 1 /3 cup of butter and allow it to slightly brown, being careful not to let it burn. Once your water has reached a rapid boil, gently place your ravioli one at a time. I only boiled about 5 at a time to prevent them from sticking together. (Tip: Gently stir once you place the ravioli into the water to ensure that they do not float to the bottom. If this happens, they might stick and possibly burst open.) Watch carefully, after about 3 minutes they will begin to float to the top. Once this happens, they are done. 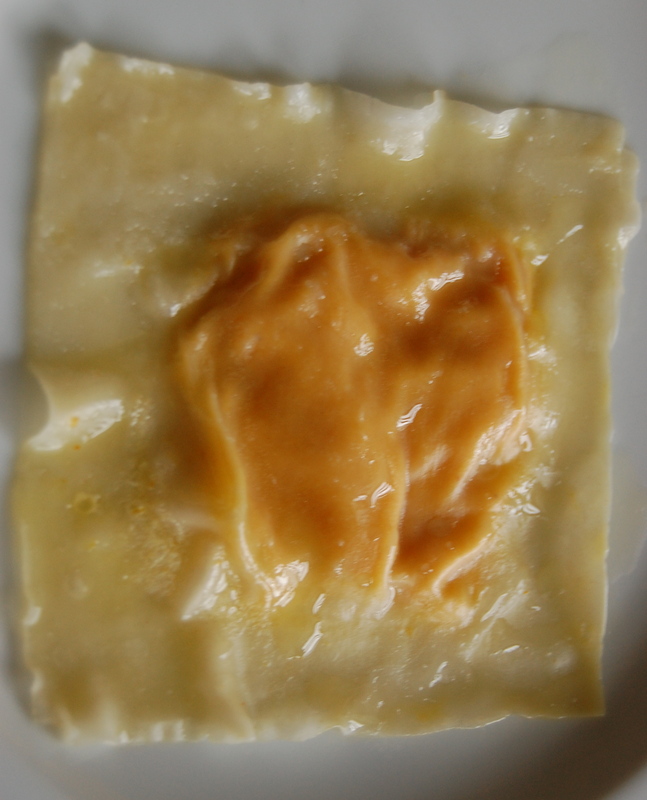 Take out each ravioli with a slotted spoon and place directly into the melted butter. You can either let them all sit in the butter and soak it up, or dip them in the butter and place in a serving dish. If you do not dip them in butter the ravioli will stick together and will be difficult to separate. Continue this process until all of the ravioli are cooked. Plate and top with the crushed almond biscotti. One bite and I was in heaven, the delicate wonton wrappers really allowed the butternut squash to shine in this recipe and the addition of brown butter just enhanced the flavor. The best part is the crunch of the biscotti, it adds just a tiny bit of sweetness. Now, I am sure some of you are wondering why I spent all that time cutting circles out of the wonton wrappers. I did some trial and error with this to see which shape would cook up the best. First I tried to leave them whole, but the ravioli seemed a bit too large and were much more delicate, making them prone to breaking while in the boiling water. 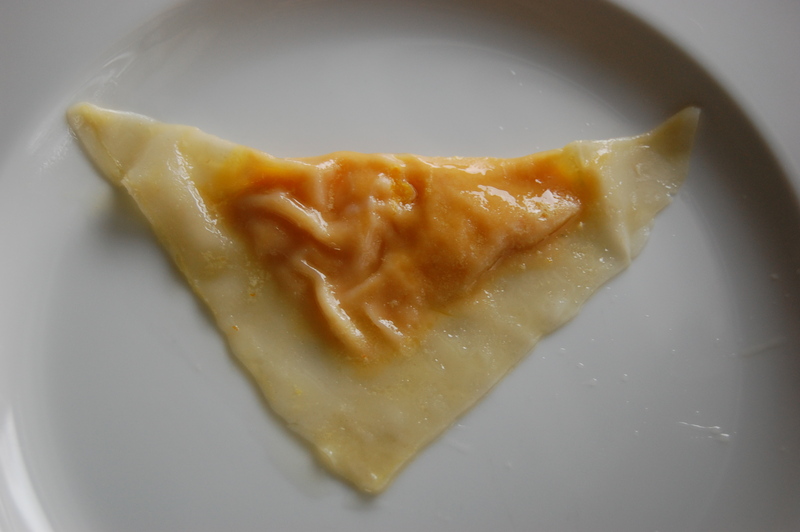 I also made triangle shaped ravioli, leaving the wonton sheets whole and just folding them in half. This worked pretty well too, but I just preferred the round shape. My whole family ate these up and enjoyed every bite. They all agreed that they are definitely worth the effort.